CS-SUNN recently engaged in a week-long radio discussion programme across three radio stations in Abuja to discuss Nutrition and its impact on women and children’s and the PACFaH advocacy issue areas. The programme which allotted 15 – 30 Minutes slot to discuss “Nutrition and its impact on women and children’s health and the PACFaH advocacy issue areas” on three radio stations, Vision FM, Kapital FM and Love FM is therefore in line with CS-SUNN’s mandate on the PACFaH project to give increased visibility to the PACFaH core advocacy areas, advocate for improved nutrition interventions, build up nutrition education especially for women and draw government’s attention in this regard so as to reduce the prevalence of malnutrition. The programme was scheduled for three different radio stations, Kapital FM, Vision FM and Love FM. Live airing and recorded versions were held on the 5th, 8th and 10th of June 2017 respectively. The slot on Kapital FM Abuja’s Day Break on Kapital to discuss Nutrition and its impact on women and children’s health was for 15 minutes. The Programme was anchored by Jerry Ikumi and Princess Akpararo with CS-SUNN’s Project Director Beatrice Eluaka as Resource/Spokesperson. The slot to discussion “Nutrition and its impact on women and children’s health and the PACFaH advocacy issue areas” on Love FM’s Health Monitor was for 30 Minutes with Mary Ijade as Anchor person and CS-SUNN’s Project Director, Beatrice Eluaka as well as Dr. David Akpotor Acting Programme Director, Strategy of the Pharmaceutical Society of Nigeria as Spokespersons. More so, 30 minutes was allotted for the discussion on Vision FM’s Clean Bill to discuss the issue with Didam Lah as the presenter. CS-SUNN’S Project Director, Beatrice Eluaka, PSN’s Acting Programme Director, Strategy, Dr. David Akpotor and FOMWAN’s Communications Officer, Aisha Sule were respondents/spokespersons. See below excerpts from the radio discussion programme. CS-SUNN’s Project Director, Beatrice Eluaka, described Nutrition as a subject that deals with the food we eat and how the body uses what is eaten to ward off certain diseases. She identified foods that stimulate growth as fish, milk and meat etc classified under proteins foods, the energy-giving foods called carbohydrate as yam, rice etch and foods rich in minerals and vitamins as vegetables and fruits, saying they prevent diseases. She emphasized that an adequate diet must contain the various classes of food. The malnutrition challenge bedevilling Nigeria, Why Children and Women are usually the most hit? On why women and children are the most hit by malnutrition; Mrs. Eluaka explained that women and children fall under the vulnerable group. She further noted that people do not know what constitutes an appropriate diet, so when they do not consume enough of the right kinds of food, malnutrition sets in. In children, she identified the indicators of malnutrition as stunting (a child being too short for his age, with poor brain development) and wasting (a child being too thin for his age). In women, she listed the indictors to include, underweight, obesity and anaemia. (11% are underweight, 25% are obese and 67% are anaemic). The CS-SUNN Project Director advised that these health issues can be addressed if children are fed the right kinds of foods, taken to health facilities when they take ill and if women eat more of vegetables and cut down on starchy and fatty foods. How can women cope and learn how to ensure adequate nutrition for their children especially as after 6 months children refuse to eat other foods except breast milk? In response Mrs. Eluaka said though Exclusive breastfeeding remains key women needed to learn how to cajole and coax children when introducing complementary feeding. With constant encouragement and cajoling, women can gradually get their children to take complementary foods alongside breast milk. She however re-emphasized that a child need take only breastmilk from 0-6 months before introducing complementary foods, like pap mixed with groundnut, milk, egg etc to increase the energy content of the food and provide what makes the child grow. According to her, as the child grows bigger, he/she can be introduced to what the family eats. What kind of foods should a woman ingest before, during and after pregnancy for positive health outcomes and optimal development of a child and Vice-versa? Responding to diets for pregnancy, CS-SUNN’s Project Director emphasized that there is no special diet for pregnancy but only a little more than what would usually be eaten. She debunked what Pregnant women popularly described as eating for two saying overeating during pregnancy leads to overweight babies which could lead to medical and health complications during labour. She also warned against cravings from harmful foods like chalk, dust etc and advised pregnant women to ensure eat all the classes of food in the right quantities. What is the relationship between food consumption and cardiovascular and non-communicable diseases in Women? She affirmed that there is a relationship between food consumption and cardiovascular diseases. She said overeating and excess consumption of fat results in health complications like heart diseases and obesity. She noted that some of these fats are contained in meat, chicken skin, junk foods, fired foods and advised women to avoid such foods. Dietary Diversification sounds alien to most Nigerians, especially in the rural areas and suburbs, what is it all about? (The Grow, Move and Shine foods). On Dietary Diversification, Mrs Eluaka said the phrase was just semantics, adding that it meant that one does not eat from a particular group but eats variety from the various food groups. According to her, one needs to eat and have a mix of all the classes of food; foods rich in carbohydrate, protein, vitamins among others. What is the relationship between malnutrition and these child hood killer diseases diahorrea and pneumonia? Dr. David of PSN in response to the relationship between these childhood killer diseases, Diarrhoea and Pneumonia and Malnutrition, said the diseases are preventable. He observed that when a child is well fed and well-nourished the immunity of the child becomes strong and immune to infections. He said there is need for proper nutrition to wad-off childhood killer diseases. What role do our religious and traditional leaders have to play to improve nutrition in Nigeria? Responding to the role of traditional and religious rulers in the fight against malnutrition, FOMWAN’s Communications Officer said Traditional and religious leaders are well respected in the society and stand as mediators between the policy makers and the governed, hence their role revolves around influencing decisions and advocating to government for improved health interventions for the populace. What is expected of government to curb malnutrition in Nigeria? To wrap the programme and in response to the last question Project director, Mrs. Eluaka explained that CS-SUNN under the PACFaH Project has engaged with the government at National and State levels, through the committees on food and nutrition, permanent secretaries, commissioners and ministers at various levels and members of both Houses of Assembly. She said there is need for government to put in more money in addressing malnutrition. According to her, good policies, plans and strategies without proper funding will not address the challenges of malnutrition. 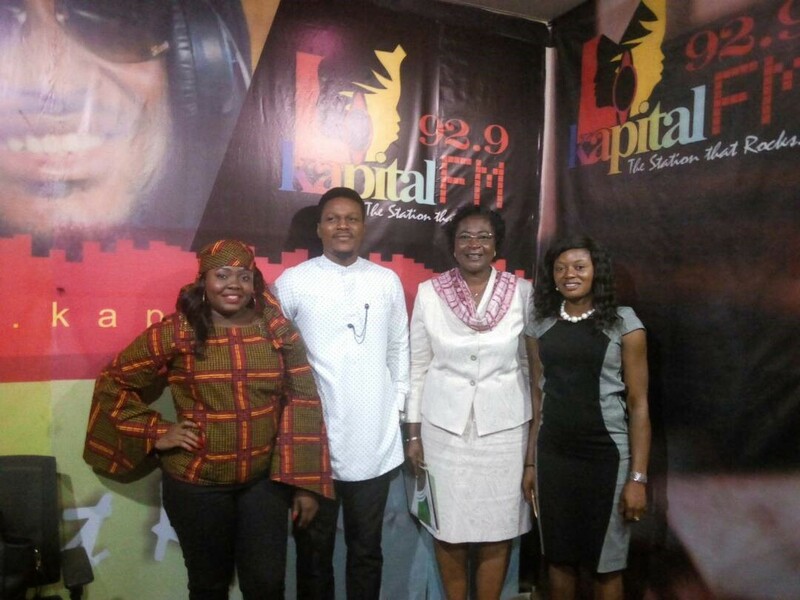 PROJECT DIRECTOR, MRS ELUAKA, DR. DAVID AKPOTOR (PSN) AND AISHA SANI (FOMWAN) ON THE DISCOURSE AT VISION FM, ABUJA. Note: Listen to the Audio Clips from our website!! !